Our supplier has drastically raised the price of rabbit furs. We apologize for the high price, but it's the best we can do. They may not be available at all in the near future. 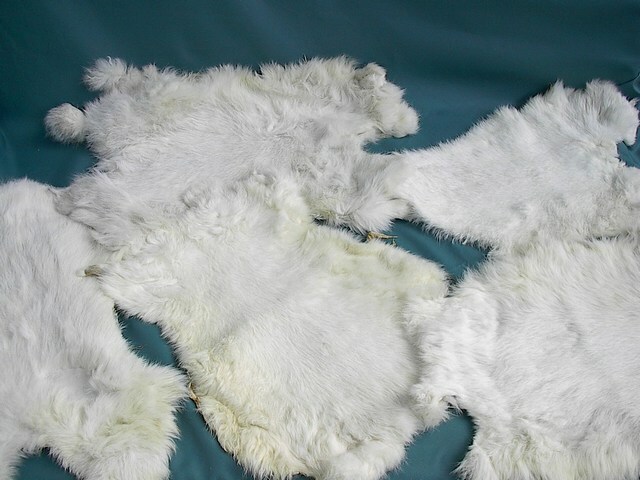 These #1 grade rabbit skin hide pelts tanned with fur on are full plush and fully tanned. There are no bald spots, rips, tears or holes... these are top grade pelts. Because they are a natural item, the degree of the white color and sizes vary from pelt to pelt. Pulled at random. We try hard to ship only pure white pelts, but sometimes there are hints of a yellowish tinge along the edges of the pelt. Average size - length 15" x width 11" but individual hides may vary slightly. You can combine different colored rabbit pelts to meet quantity discounts. Our shopping cart will automatically recompute the prices when the next discount level is reached. Great for craft projects or to use in counter displays.